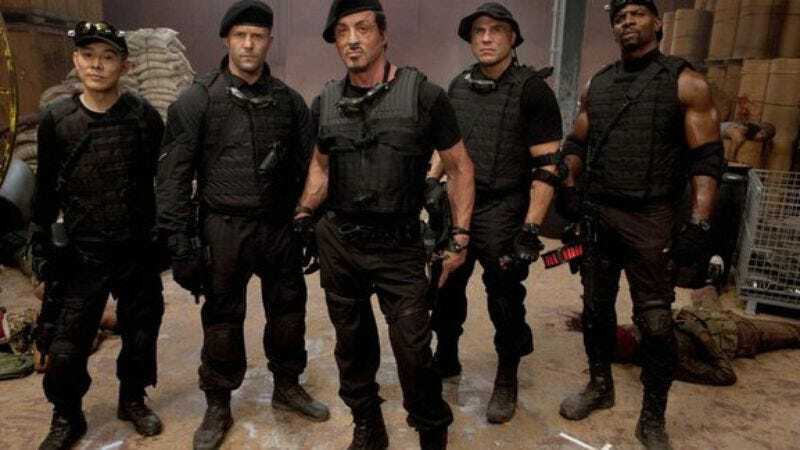 With the August release of The Expendables 2 fast approaching, there’s finally some closure in the previously reported lawsuit brought against Sylvester Stallone and others by Marcus Webb, a man who claimed Stallone swiped his idea. Yesterday, U.S. District Judge Jed Rakoff granted a defense motion to dismiss the suit, though everyone involved in the case has yet to comment, and the judge himself said his reasoning would be announced “in due time,” according to Reuters. Webb’s suit—which included Stallone’s screenwriting partner David Callaham as well as Millennium Films, Nu Image Films and Lions Gate Entertainment—claimed that the film had ripped off his own original story, The Cordoba Caper, which he said he had registered in 2006 and been shopping around Hollywood ever since. In their motion to dismiss, defense attorneys called shenanigans, claiming Callaham had already written several drafts of the film’s screenplay by that time frame. They also pointed out that there was, conveniently, no evidence that proved Stallone or Callaham were even aware of the existence of Cordoba during their fine-tuning of the subtleties of their Expendables script. Judge Rakoff also didn’t buy into the argument that the fact that both stories feature a bad guy named General Garza (“the 34th-most common Hispanic name,” per Reuters) was any evidence of thievery on Stallone and Callaham’s part. Somewhat damningly, he also noted the simplicity of the Expendables story, versus the more complicated caper aspect of the Cordoba plot. And with this resolution, the world can now turn its attention to other Expendables-related entanglements, like Chuck Norris' bizarre "pro-gay Boy Scouts of America" theorizing, which is far odder and more interesting.